UNITED NATIONS, March 26 -- The UN Security Council's second session in a month on the conflict in Sri Lanka was a "friendly censure" of the government, according to Jorge Urbina, the Ambassador of Costa Rica, a member of the Council. Following a closed door session at which Sri Lanka's Mission to the UN showed pictures of the conflict zone, U.S. Ambassador Rosemary DiCarlo said that Sri Lanka has been shelling areas with civilians, near to hospitals. She said that the camps for internally displaced people, which she called interment camps, would only be funded by the UN for three months. Video here. Top UN Humanitarian John Holmes, on the other hand, said he "wouldn't like to put a time" frame on how long the UN would fund these camps, from which IDPs cannot leave or receive visits, even from family members. Likewise, he declined again to confirm his own agency's figures of 2,683 civilians killed from January 20 to March 7, a number that only came out because the document was leaked to Inner City Press. Holmes' equivocation, combined with UN Resident Coordinator Neil Buhne's even more pronounced placating of the government -- which has led senior UN officials in New York to say Buhle has been "captured" -- have led the Sri Lankan government to claim that no one in the UN has criticized their conduct in the conflict, neither from the UN Secretariat nor from UN member states. Following, most pointedly, the public on-camera statements of U.S. Ambassador DiCarlo, that claim has been debunked. Inner City Press asked Sri Lanka's representative after the meeting to explain his Foreign Minister's claims. He said he would have to look into them. Asked when the newspaper editor locked up during the conflict would be put on trial or released, he said "I am not an astrologer." He said the Army is closer than one kilometer from the zone, but is holding back. A senior UN official on March 25, the day before the Council meeting, said that the UN internally is increasingly worried of a "nightmare scenario" in which the government makes a final push, tens of thousands of civilians end up dead and "everyone blames the UN." At least in its worries, the UN shows foresight. Perhaps the beginning of wisdom is to worry about the right things. U.S. Ambassador DiCarlo said the number of civilians trapped between the LTTE and the government number from 150,000 to 190,000. 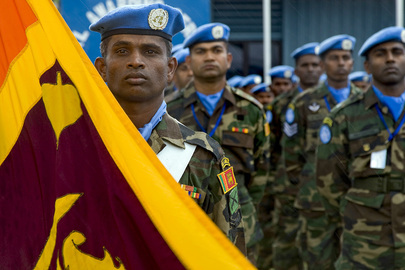 The UN's Holmes added the Sri Lankan government's figure, 70,000. We note that he also wryly stated, on his way into basement Conference Room 7, that "this meeting doesn't exist," a reference to its strange location, title and format, a concession by the Council to its members who wanted no briefing at all. Holmes has to deal with politics. The question is, when must humanitarian principles unequivocally win out? French Ambassador Jean-Maurice Ripert, who spoke as he rushed out of the meeting, said that "both sides must comply with international humanitarian law." He added that the Sri Lankan government is asking countries with Tamil diaspora populations to make sure money is not donated or exported from their soil to the Tamil Tigers. How this would be implemented by the UK is not clear. UK Ambassador Sawers spoke briefly to the Press, but not on this point. Video through here. The senior UN official who spoke to Inner City Press spoke of a strategy of making Tamils outside of the country aware they could be charged with crimes. If this is the UN's plan to help the civilians, the UN-enunciated "responsibility to protect" should begin at home.